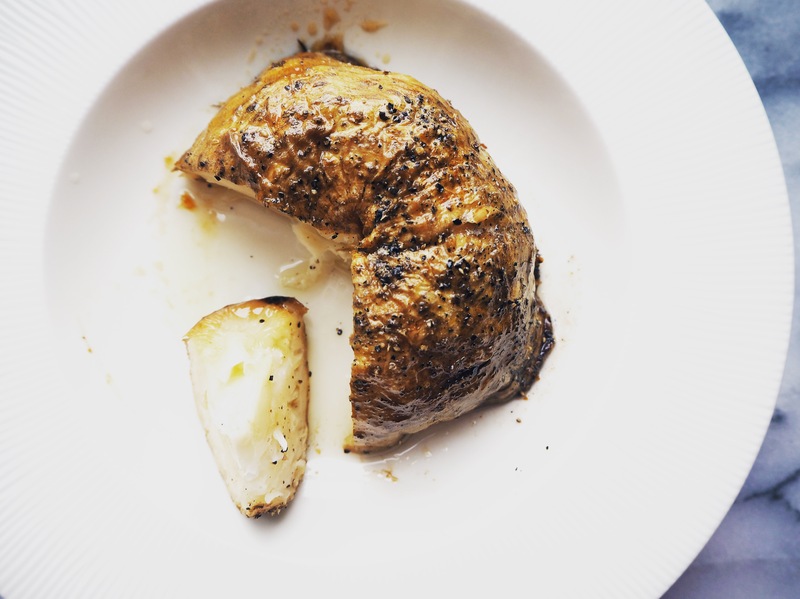 Roasted Whole Celeriac – Oh Please Love Celeriac! Ever since I was a kid with a very picky appetite, I loved celeriac. I loved everything about it. I loved its taste, its smell, its weird shape. For years I ate it the same two ways, one as my mother cooked with onions and peas and carrots, the other as raw salad with mayonnaise. And I was happy. 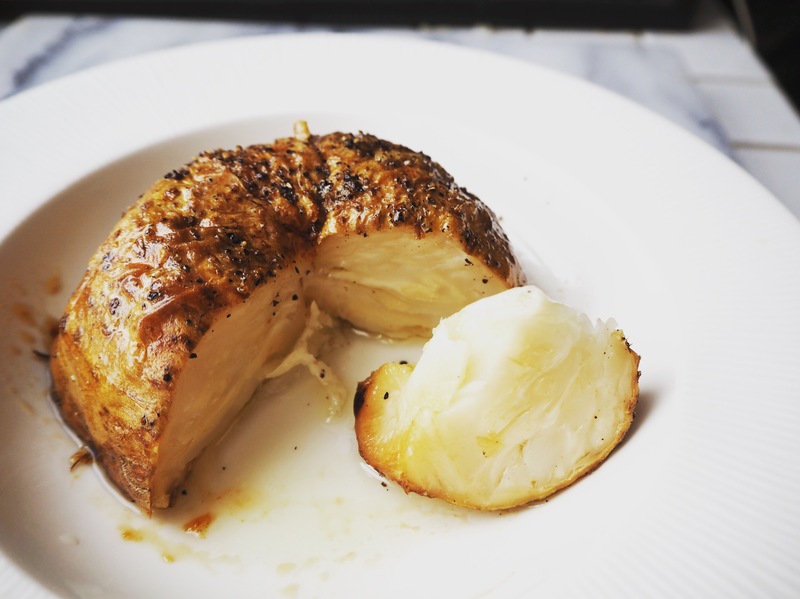 Just when I thought it couldn’t get any better and tastier, I ate a whole roasted celeriac dish in a quite hipster restaurant in Berlin in October 2016, and it changed my life. I knew, after that moment, that celeriac was the most amazing vegetable. 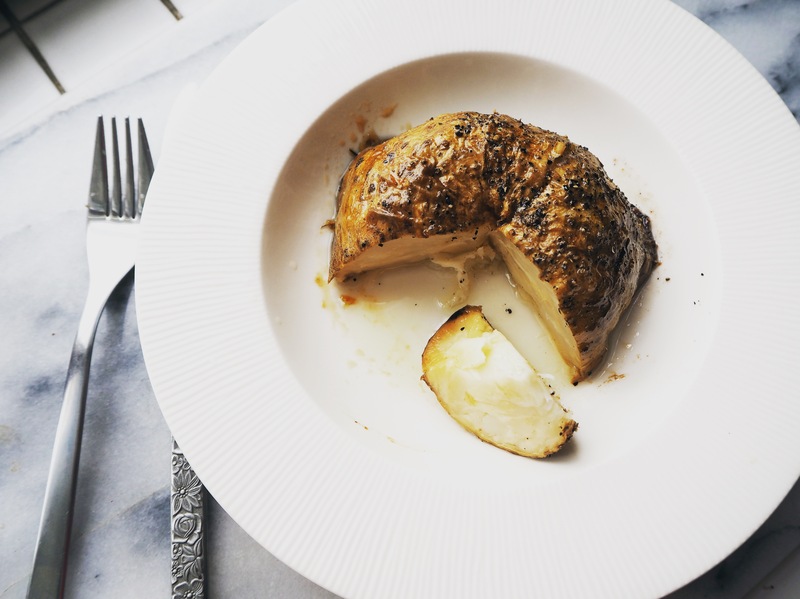 And so I made my mother’s traditional celeriac dish once for one of my Mediterranean brunch sessions and I was surprised that people didn’t even recognise this beautiful vegetable. It was written on the label “celeriac cooked in orange juice with..” and they asked me what celeriac was. I replied as celery root, or juuriselleri as in Finnish, but most people still looked at me puzzled. Some didn’t even see the label and took it to their plates thinking that it was potato, only to realise that it certainly was not, at the first bite. I couldn’t believe this. Celeriac is in regular Finnish markets all year round. You can find whole celeriac or if it’s too big for you, you can buy packed half or quarter celeriac. I mean, some people out there must be buying those. But I guess those people didn’t come to my brunch that day. I know that some people do not even get close to this beautiful vegetable because of its quite weird shape. They think it’s ugly (which is something I disagree with all my heart!). Some people find its smell a bit repulsive, but I think it is one of the most refreshing smells! Many people do not know or do not like it as first but they can grow to like it eventually. Celeriac tastes refreshing, a bit sweet and very aromatic. It is soft and juicy when cooked well. This version is even softer, juicier and has a very intense aroma. When I was eating it today, I felt like there was a festival inside my mouth – the same feeling I had when I ate it in Berlin. 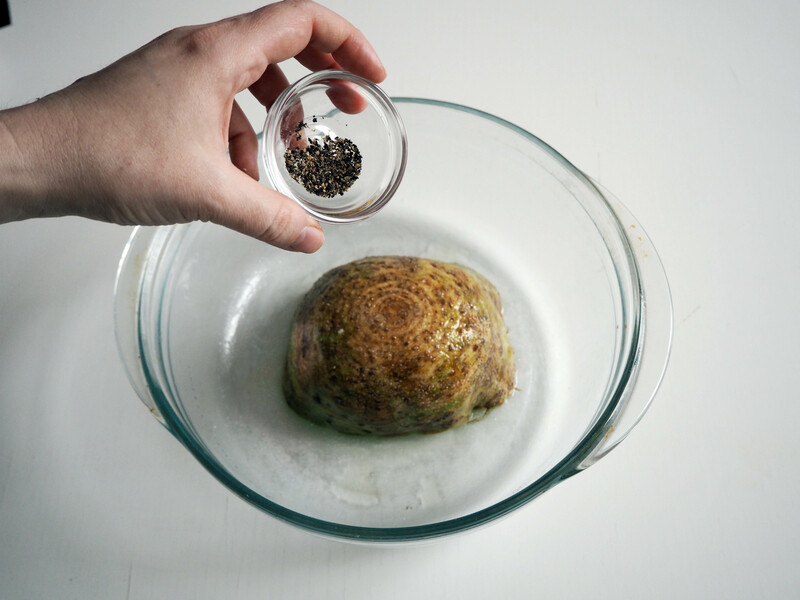 Preparing celeriac for roasting is very easy. It just takes a long time to make it really soft and juicy. You can keep the skin on like I did and eat it or not, or you can peel it and roast it like that. I recommend you try and find how you like your celeriac yourself. In any case, you will have a delicious, juicy and a very aromatic dish. And very healthy! Celeriac is very nutritious with tons of health benefits, vitamins, minerals etc. 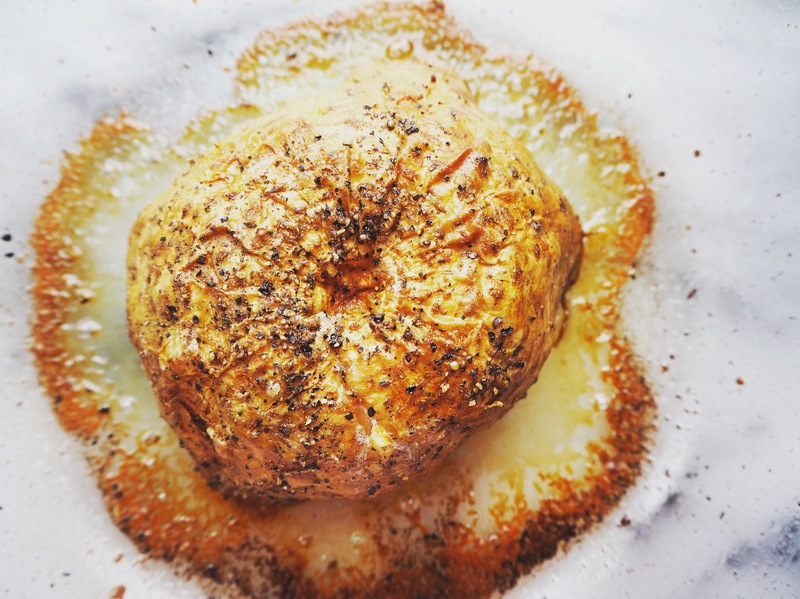 So yes, you just HAVE TO love celeriac. Please do! 1. Preheat the oven to 180C. Wash your celeriac as I wrote above if you haven’t already, and pat it dry. 2. Cut the root part (I’ve seen people keeping it but I like to cut that part). At this point, if you do not want the skin, just peel the whole thing. 3. 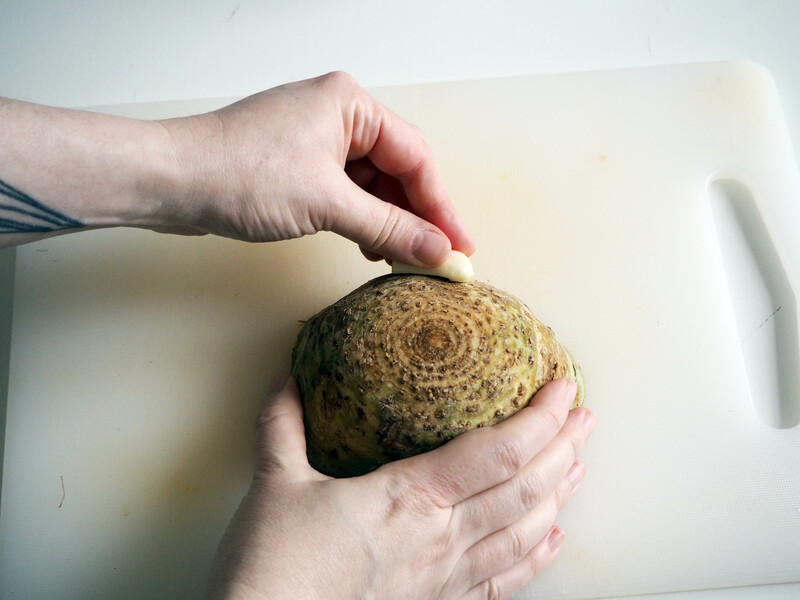 Cut garlic clove in 2 and rub the cut surface generously on celeriac’s surface. 4. 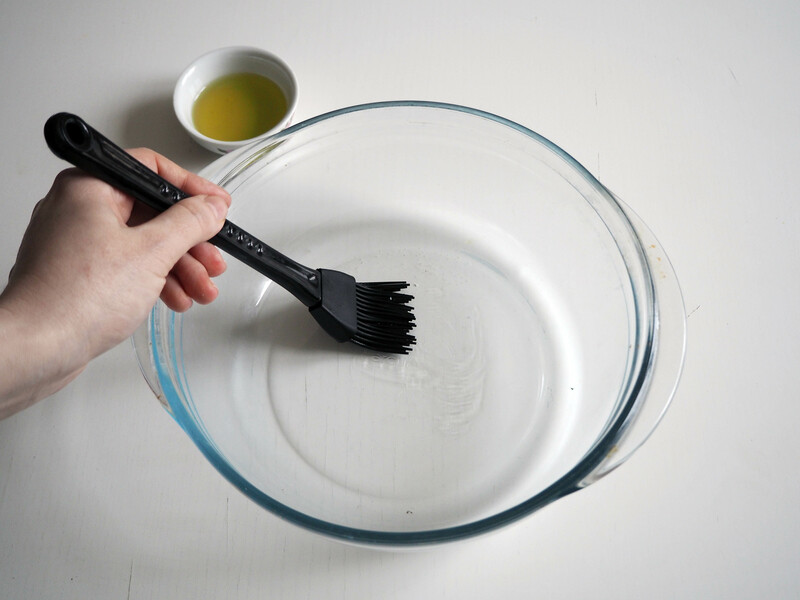 Grease an oven dish with some of that 1 tbsp olive oil. 5. 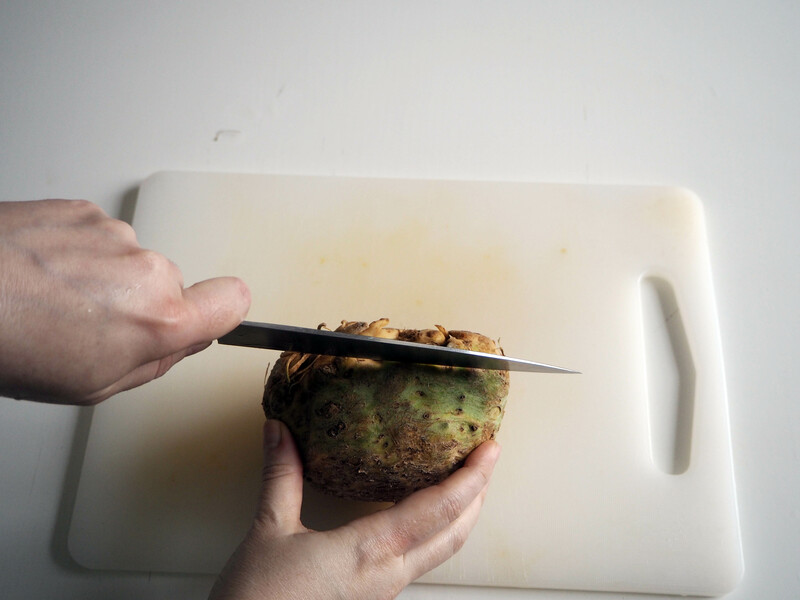 Put celeriac on the dish, on cut root side. 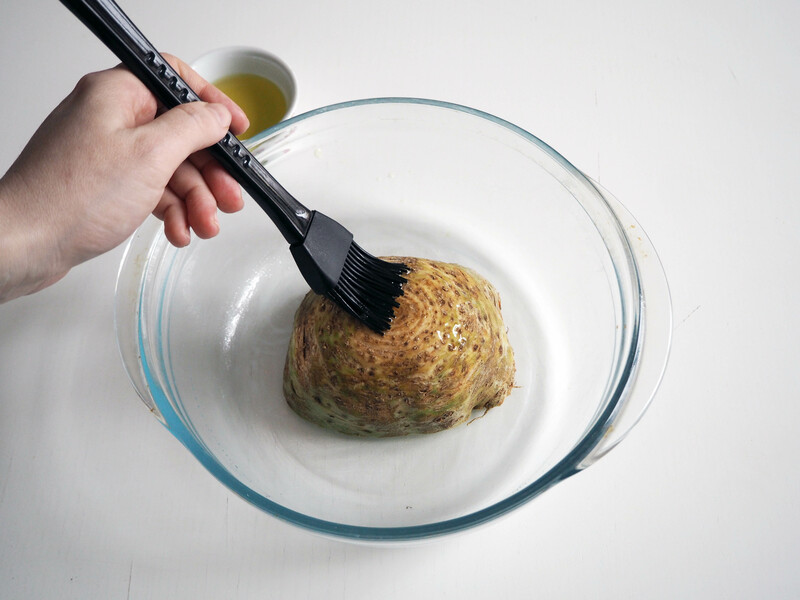 Brush the surface of the celeriac generously with remaining oive oil. Sprinkle salt and pepper generously. Put in the oven, in medium rack and roast for 1.5 to 2 hours, until it is soft and cooked (n my oven it took 1.5 hours but you might need a bit more time, just keep checking). After you take it out of the oven, let it cool for about 10 minutes at least. 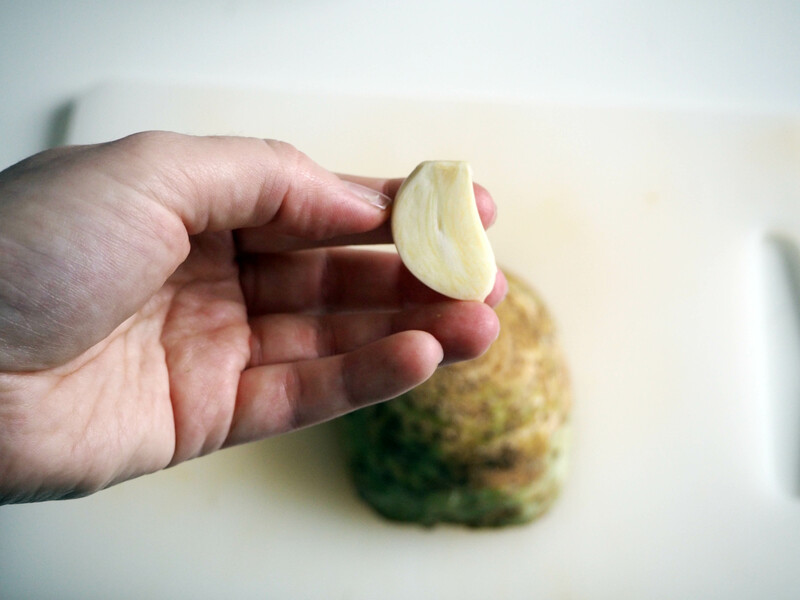 Then take the celeriac to your plate or to a service plate and either cut wedges or slice it in thin pieces. Drizzle just a little more olive oil on pieces before you eat. Serve and eat fresh. You can decorate with some herbs and you can also serve with some crème fraîche. Enjoy! This sounds really good Asli. Celeriac isn’t very here and I’ve only ever bought it once so I’m saving this recipe to try when it comes into season again. Great! 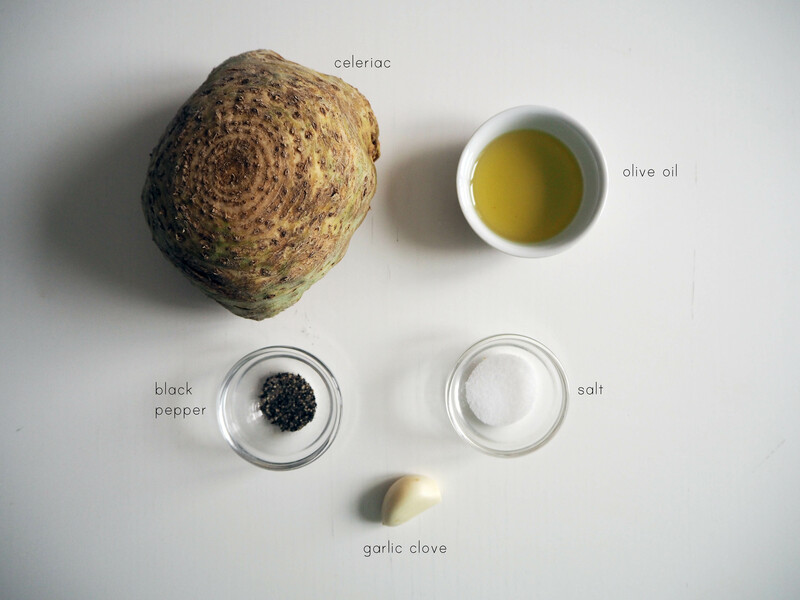 Please try, i love everything about celeriac! Interesting variant, have to try it! If you are in a hurry another way to make something I believe similar is to just slice 1/2 cm thick slices and fry them in oil in a big pan on the stove. That way they will soften in 10-15 minutes. My mother used to boil the slices briefly and then bread them before frying, but all that is completely unnecessary. 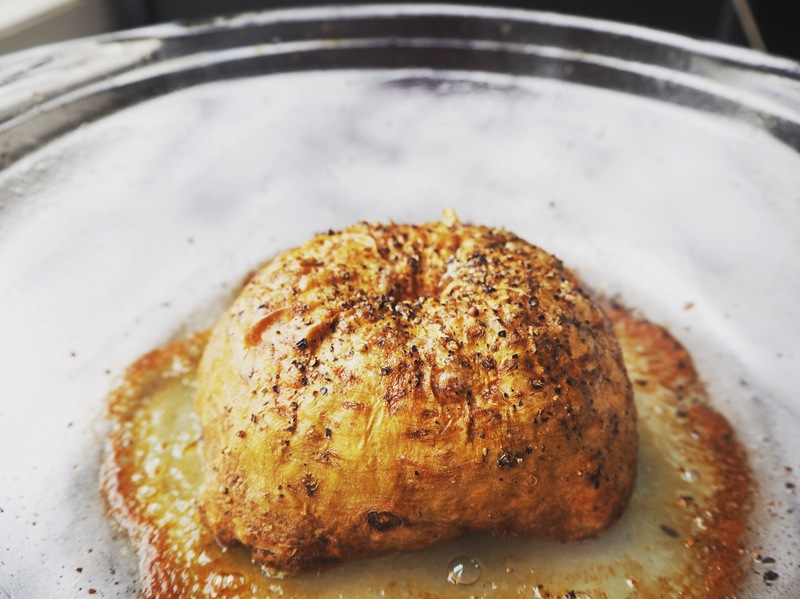 Frying, that’s one thing i didn’t yet try with celeriac – i should! What gorgeous pictures! Looks utterly delicious! 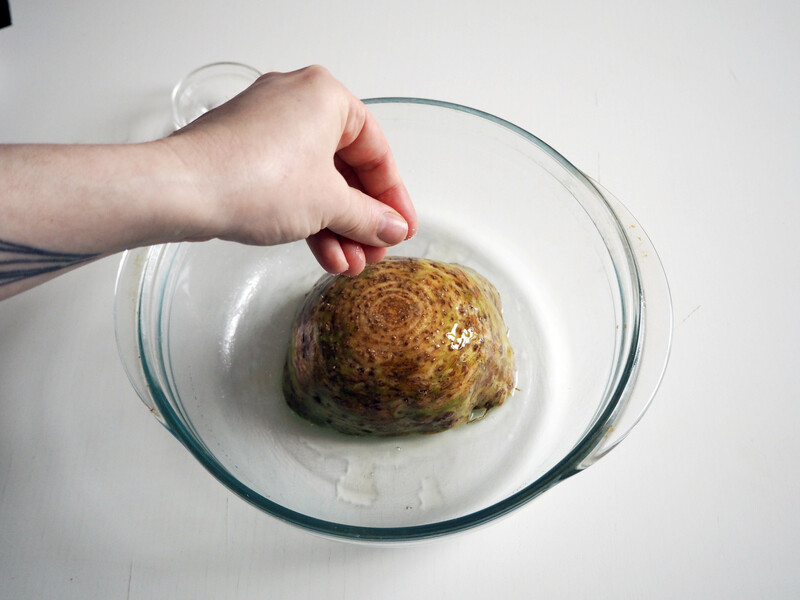 I love celeriac – also because of how weird and awesome it looks -, and I’m definitely tempted to try this! And if I didn’t already like it, this would have definitely convinced me, haha. I’m also thinking of maybe using some celeriac when I make a new batch of fermented veggies next week. Oh yes i love how it looks too! And I feel sorry for it because some people think it looks too weird and doesn’t even try only because of that!! Anyway, I never tasted fermented celeriac, tell me how it goes!! Previous PostThe Goddesses of Food – One, Two, Three, Women!